As an instructor, you can manually add students to a group in both published and unpublished courses. Confirm you have created all the groups for this group set. If you need more groups, you can create additional groups manually. In the Unassigned Students section, find the student you want to add to a group . Click the student's name and drag it to the group . You can also click the student name Add icon  and select the group name . 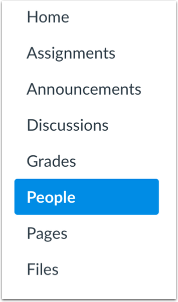 Canvas will update the member count for that group to show the student has been added . Continue to manually add students to groups until all students have been added. To expand the group and view all group members, click the arrow icon next to the group name . You can also move students between groups if necessary. Previous Topic:How do I automatically assign students to groups? Next Topic:How do I assign a student leader to a group? Table of Contents > Groups > How do I manually assign students to groups? Hello - I have a faculty member who needs to manually add students to a few groups and I don't know what to advise her if the assignments have already been published. What are the possible issues? The information at the top is vague, "Grades and submissions may be affected for students who were not in a group at the time of assignment submission but who were later added to a group." If this your instructor's first time using groups in a group assignment, it should affect much. However, if she's used groups for previous assignments and then changes those groups, it could affect previous group assignment submissions and grades. For example, if a student submitted an assignment on behalf of their group and that same student was moved to another group, it might make things a little complicated as far as which group the submission and the grade for that submission lies with. If your instructor needs to make changes to a previously used group, I'd suggest having her create a new group, so as to not affect previous submissions and grades. Hope this helps clarify. If you have other questions or concerns, please let us know.